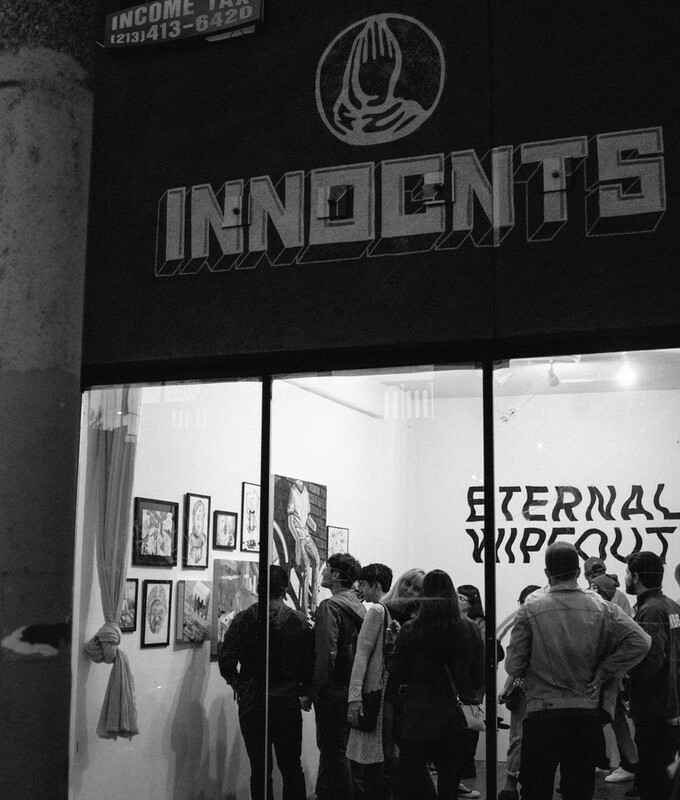 Eternal Wipeout went down last Saturday at Innocnts Gallery with much success! New works from South Bay's finest Murk Lurks and Matt Borgia made for a rad evening of art, music, booze, and good vibes. Big thanks to Pabst Blue Ribbon, Pizzanista, Rad Coffee Truck, and Krusin Skate Shop for their support! And heavy shakas to Sweet Reaper for their rad performance! Check out their bandcamp for more! The exhibition remains up until May 26st. For exhibition catalog with available work contact us here. Opening this Saturday (5/9) 7pm at Innocnts Gallery || ETERNAL WIPEOUT || featuring new works by Murk Lurks and Matt Borgia!! Performance by Sweet Reaper and vinyl sound selection from Tony Accosta!! Cold brews via Pabst Blue Ribbon with free Pizzanista till it's gone. Rad Coffee Truck on the scene as well! It's gonna be a rad night!!! Innocnts Gallery is proud to present a special record release performance by guitarist Maxwell Gualtieri, percussionist Corey Fogel, pianist Maya Dunietz, and bassist Devin Hoff in conjunction with Maxwell's recent release on pfMentum Records. The evening starts 8pm at Innoncts Gallery in Echo Park. $5 cover with seating and standing room. A really cool thing happened when we were hanging Teebs solo exhibition Overgrown a few weeks back at New Image Art. Yes we were drinking IPA's but that's not what I'm speaking of. In the process of hanging the 200 small abstract studies we began to pick out favorites and that evolved into a cool discussion, critique, and process of elimination leaving us with one final piece. Well we had so much fun doing it we decided why not let everyone else who feels inclined do the same. So we did just that on April 1st at New Image Art where Innocnts hosted and moderated a cool discussion in which Teebs spoke candidly about the work and process that went into his recent solo exhibition at NIA titled OVERGROWN. Together as a small group gallery patrons picked out 2 favorite remaining unsold small abstracts and were then asked to discuss what about those particular pieces they found interesting. The critique and discussion was thoughtful and by then end we had one remaining piece. Teebs surprised everyone by allowing each participant to take home the piece in which they spoke for. It was a great night of discourse around art which should really happen more often amongst art appreciators. Look forward to doing more similar things like this in the future at Innocnts. Sometimes the best way to find great artists is to have another great artist turn you on to them. Such is the case with with Los Angeles based artist Kris Chau who we recently became familiar with. Innocnts is very pleased to be working on a solo show of her latest series Gods Of Summer coming to Innocnts Gallery in September. Stay tuned for more details! New Image Art is pleased to present, This Crazy Life, a group show featuring Gregory Bojorquez, Patrick Martinez, and Michael Vasquez, opening Saturday, April 26, 2014, 7-10pm. This Crazy Life encompasses the poetic commonalities found in today's urban/inner city environments. The works depict an authentic viewpoint of "beauty through chaos" that seems so natural within the backdrop of urban struggle and growth. By interpreting their own personal realities through forms of portrait based photography, paint, and mixed media, these three artist are able to inform and contribute to a larger social understanding of urban culture through their contextual relationship with art.